One image summing up an entire story. 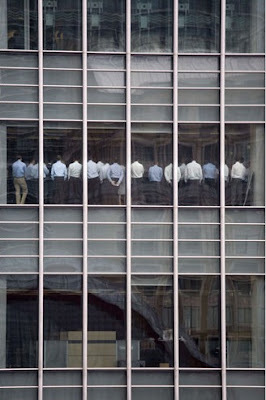 Employees at 25 Bank St, Canary Wharf, the headquarters of Lehman Brothers, London. September 11 2008. I know the subject matter is not a funny one, but I love the photos! It is...well I won't say what here but I think that photo will become a classic. TRUST! You posted this just a few days ago and now they are caput! Sad, but we all saw it coming. What's next?